While giving the finishing touches to my plots I realized that in one place instead of Erlang Distribution I had used Exponential giving a slight error in the plots of my numerical analysis. As I had to compute the numerical values again, I ventured out with my camera while the computers in my lab started heating up. 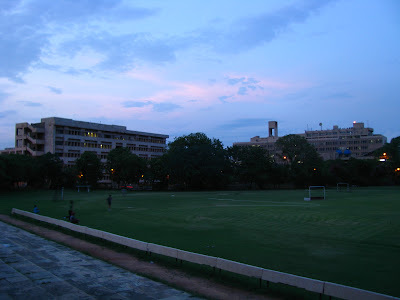 As it was twilight I ventured to the hockey field, from where you can see both Bharti Building and the Main Building of IIT, as shown in the photo below. I had dinner and watched a few minutes of Zeitgest (comments on which shall come later) and started walking back to the lab. 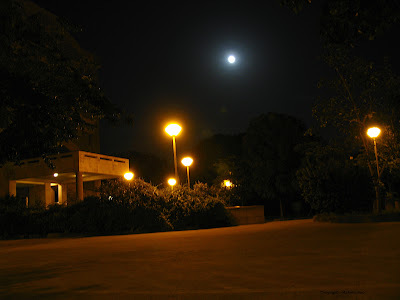 The moon was high and the moon rise was not 10:37 p.m as Emacs had shown. I have to find out the reason for this error which might be between the computer and the chair. 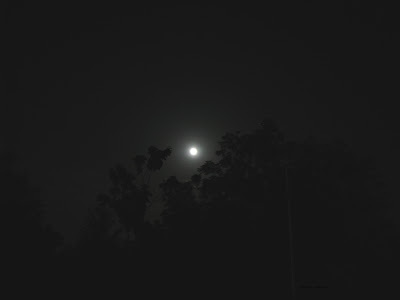 Anyways, this is how the moon was seen near Zanskar Hostel (the gate next to the Juice shop). The doggies lying there were curious of what I was doing and one of them who was staring at the LCD screen gave a small nod after I clicked this one. On the way back to Block VI lies Bharti Building. These lamps cause a lot of Light Pollution as a result of which you cannot see the stars and the planets. But this day the moon was bright; brighter than all the lamps lit. 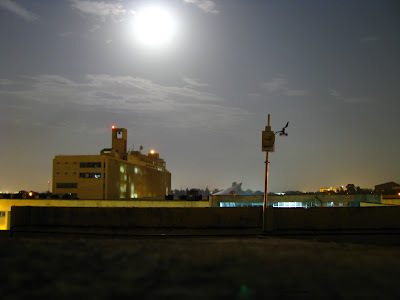 This photo was taken from a crooked chair outside the Power Station which is situated next to Bharti Building. Navneet was the only guy present in the Security Lab (the lab next to the one I sit). We went to the top floor of Block Six and this eerie image is the one obtained by setting the exposure time to 15 seconds on a full moon night. I only hope I might have not destroyed the sensors in my camera. Please notice the light pollution on the bottom left and bottom right of the photo.